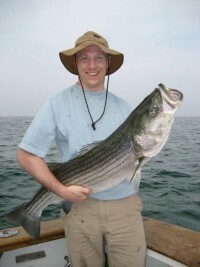 I went striped bass fishing in Cape Cod last week aboard the Salt Shaker. Captain Dan, who has been fishing there for about 30 years, has intimate experience with fish, tackle, currents, temperatures and the bay; which means that I’ve pulled in some big stripers each of the last 6 years I’ve been out with him. It turns out Dan is an experienced, savvy online marketer as well. On the 45 minute ride back from the fishing area, I asked him about how he markets his one man charter business. What follows is a rough recollection of his comments about PPC advertising. And he’s right – the economics of pay per click advertising mean that the return on investment for Bing will outperform Google. Here’s why: In the PPC bidding system price impacts not only who wins, but also how much they win. Simply put – because web searchers tend to click on things higher up on the page, buying your way to the top means you’ll get more clicks. This means that PPC traffic is one of the few items with negative economies of scale – where the more you buy, the higher the per item costs. And the more bidders there are in the system, the higher that price goes. This is exacerbated by attorneys who have translated 3 years of get-to-the-top-of-the-class education to ridiculous, irrational PPC bidding wars. Because Google is the dominant search engine, most small businesses dip their toe in the PPC waters with Adwords, not Bing Ads. At the risk of stretching the metaphor too far – they are fishing where the fish are. And this seems to make sense – but because the market is so crowded with all the other small businesses doing the same, the economics don’t pan out as well. Essentially, while there is more volume of searchers at Google, the crowded marketplace makes each of these searchers more expensive to buy. So, if you are running Adwords and not Bing Ads, you are flushing money down the toilet. You will get less volume at Bing – but it will cost much less per click – in Captain Dan’s case, about 75% less. And this is the key to ROI. To make things even easier – Bizible has just launched a free tool that will auto-tag a Bing advertising account with Google Analytics tracking code. Get started.